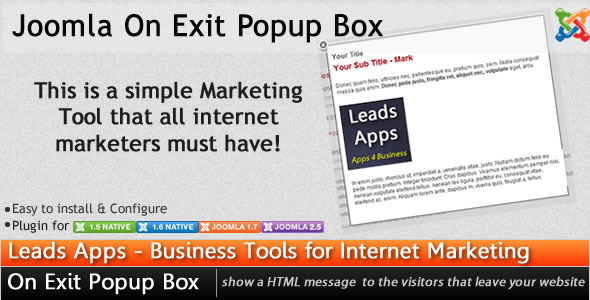 Joomla On Exit Popup Box show a HTML message to the visitors that leave your website. When visitors try to close the browser or try to change tabs or close tabs the browser window it show a modal box with your HTML message configured in backend. 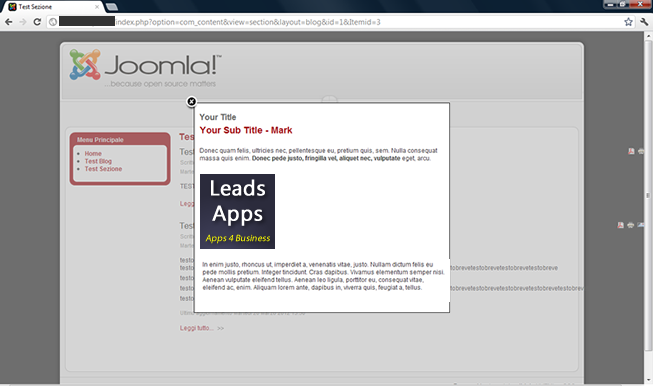 write a new URL or any other task On Exit Popup Box for Joomla will be launched. This is a simple marketing tool that all internet marketers must have! Capture the attention of those who want to leave your site and get a second chance to give them a special offer, discount, news, events, all this before I lose them forever. This tool is very useful for those who want to increase profits. Developed For Joomla 1.5 Latest ver 1.5.26 /1.6/1.7/2.5 Easy to install & configure. Do you want more features ? to see PRO VERSION with a lot of extra features and new events for popup. Note: If you install & use Module you can use different Event for different page. Load Popup after the time you want when visitors enter your site, and you can also set the option recalls. Load Popup when press mouse right click. Note: This event does not prevent copying to the Site or otherwise, at the time it was designed only to load the popup. Loads Popup after keyboard key combination. Click Here to see a list of list of supported keys.